Vehicle Age: 2008 - 2010 models. Three is definitely not a crowd in this camper! With a comfy double bed and single bunk bed and a porta potti, you and your mates will have a ball in the Highball! With your basic camping gear plus some kitchen essentials like a fridge for the drinks, gas stove or a microwave for a quick meal, you will be set for a real adventure. Don’t forget to pack soft bags instead of a suitcase – much easier to store in the camper! (Max weight for top bunk is 60kg). As this may be a tight fit if travelling with 3 large adults, a Double Down or Double Up may be more comfortable. Certified Self-Contained. Vehicle is permitted for Freedom Camping. 1 x child OR 1x booster seat can be fitted. Minimum hire age of driver is 18 years. Enjoy the comfort of a double bed, hot shower, kitchen appliances and your own loo in your campervan – all the basic essentials you need. Microwave yourself some popcorn in this super roomy campervan that sleeps 2. Includes a handy toilet and shower so you’ve got everything you need. 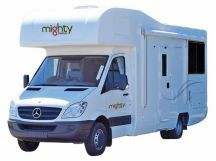 For a fantastic New Zealand road trip adventure, hire the Mighty Deuce today. Vehicle 2009 - 2012 models Mercedes or similar. 2 seat belts. Children under seven years must not travel in this vehicle (child or booster seat cannot be fitted in this vehicle). This vehicle is certified self contained and ideal for freedom camping in designated areas. Introducing the perfect camper for 2 adults and 1 child,available from 1 April 2019. The Deuce Plus has a double bed at the back and a single at the front make for a comfy night's sleep for a small family. Add the bonus of a shower and toilet and you've got the perfect getaway vehicle! 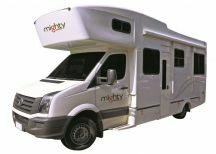 This vehicle is certified self contained and ideal for freedom camping in designated areas. 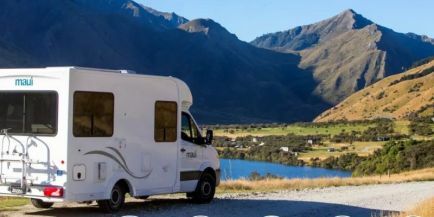 For a fantastic New Zealand road trip adventure, hire the Mighty Deuce Plus . Vehicle 2014 - 2016 models Mercedes or similar. 3 seat belts. One child or booster seat can be fitted in this vehicle.